Every year on St. Patrick's Day we get together with two of our favorite couples and cook a big dinner of corned beef and cabbage, Guinness beef stew, and colcannon. Even though we take turns hosting the event, I'm always responsible for bringing the Irish soda bread and a dessert. The soda bread recipe is always the same--I use Ina Garten's recipe, because it's 1) delicious, 2) easily adaptable, and 3) even better the next day toasted with a generous smear of soft, salted butter. I make two versions of the bread--first, the recipe as written, gloriously orange-scented and studded with ruby-red currants. For the second loaf, I omit the orange zest and fruit and replace it with two tablespoons of aromatic caraway seeds. The anise flavor of the caraway pairs especially well with the pickling spices used to flavor the corned beef and cabbage. Pair a warm slice with a little nip of Linie Aquavit, (a Norwegian spirit distilled from potatoes and flavored with caraway and star anise), and you're pretty close to heaven. I added a third loaf to the mix to this year--a simple beer bread recipe. The texture of this loaf reminded me of banana bread, which was a bit unexpected, but worked well when topped with butter and dipped into the delicious pot of Guinness Beef Stew my sister made. For dessert, I made Veggie and the Beast's Chocolate Stout Cupcakes with Whisky Buttercream and Salted Caramel. Needless to say, these were a big hit. The batter was extremely liquid, so I ended up using a tiny ladle to gently spoon it into the muffin tin. Since we had a bigger crowd this year, I doubled the recipe, and ended up with five dozen cupcakes. To flavor the caramel and buttercream, I used Jameson Caskmates (Stout Edition); the tang of the stout in the whisky really brought everything together. These dark, luscious babies took me over four hours to make from start to finish. I ended up with two small jars of left-over salted whisky caramel, which I plan to drizzle over some good vanilla ice cream this weekend. While everything was baking away, I snuck over to my little corner of the couch to knit rounds and rounds on my log cabin sock. Being perpetually cold, I've added these to my personal queue for the fall. I'm thinking about trying Woolfolk Luft, a 55% merino and 45% organic pima cotton blend, to keep them light and fluffy. This week, I plan on finishing this first sock, then continue working on my secret project, which I hope to complete by the end of the month. How about you, fellow knitters? What are you working on this week? Only 84 more rows of lace (or, 21 more pattern repeats) to go on this charmer. The deadline is fast approaching on this project, as it was a commission piece from one of my co-workers. As of today, I'm going to bring this beauty into work with me each day so that I can knock out a few rows during my lunch break. Even though I work in a corporate office, I'm lucky enough to have rocking chair and knitting basket in the corner of my office. It's one of my favorite places to take a five-minute time-out when I'm feeling stressed or just plain-old tired of making decisions. Sitting and knitting just a row or two on a small project helps clear the clutter out of my brain and refocuses my energy. After these mini-sessions, I see burst in productivity, so I don't feel too guilty about taking a few minutes here or there! How about you? Do you bring your knitting to work with you? Last week was the best mail week ever. I received not one, but two packages from Quince & Co. The first contained four skeins of Tern sock yarn in springy shades of pale blue and lavender (Oyster, Mist & Dusk). These are for a new lace sock design I've been tinkering with over the winter, and it will be hard to decide which color(s) to use! I also splurged on a bottle of Twig & Horn's Wool Soap in Rosewood. I'm a sucker for good packaging, and I love the minimalist label and how you can see the milky soap through the clear glass bottle. The second--and most important package--contained three simple skeins of Lark worsted-weight wool in the Canvas colorway. As is tradition, they came snuggly wrapped in Quince's classic brown paper bag, tightly sealed with the bright-white, circular Q sticker. Opening a Quince package is always like opening a Christmas present, however, this time, peeling back that sticker and opening that brown paper bag had a whole new meaning to me. You see, these three skeins mark a big first step forward in my knitting journey. And while I can't reveal the project yet, I will say that I did not expect an opportunity like this to come along so soon! The busy season at work is finally over, which means holiday knitting projects (and blogging) are back in full swing! Three projects are already off the needles, and this weekend, I happily cast on for project number four — the Bray Cap by Jared Flood. Part of the BT Fall 2013 collection, it's the right amount of 'cool' for my 13-year old niece. Every year, she gets a new Christmas woolen — usually, a classic stockinette cap. This year, since she's becoming a little more responsible with her belongings (meaning: less prone to losing things), I thought it was time to 'move her up' in knitwear — both in quality of wool and complexity of pattern. The yarn is Shelter, in the Soot colorway. As if you don't already know, this wool is a true joy to knit with. I'm hoping that she thinks of this hat as her first heirloom piece — the one she'll reach for time and again; the one she'll send back to me for mending one too many times. These are things I like to think about when I'm making. p.s. Yarn purchased online from the charming Loop Yarn in Philadelphia — thank you again for shipping the yarn so quickly! It was nice to get back to normal this weekend...last week my company had its annual Leadership Meeting, where 200 of us are sequestered away offsite with each other for the majority of the week. I had to give a 30-minute presentation to the group, which I was extremely nervous about, since public speaking pretty much freaks me out. After about a dozen or so practice runs, I felt pretty good about getting up on stage--but I have to say, once I hit that last slide in my presentation, I felt such an amazing lightness knowing that I had made it through (until next year, anyway). I was happy to return home and settle back into my creature comforts. For me, this meant knitting and puttering around the kitchen. Before my eyes could fully open on Saturday morning, I immediately finished up the ribbed edging on the cowl pattern I'm working on. The second picture shows it fresh off the needles--a shriveled, heavy mass waiting for a good, long soak in a Eucalan bath. It's now pinned and blocked within an inch of its life in the guest room. This one was tricky to block...I think perhaps Hunter has the right idea! On Sunday, I made a Dutch baby for breakfast (this one, if you're so inclined), which I first read about on Alicia's blog. I break this recipe out once a month, when we're feeling particularly decadent and want something cozy and warm to start our day. We had some of the season's first apples stored in the fridge, so those were peeled, diced and warmed over in a pan with some butter, dark brown sugar, and cinnamon. (Promise you'll try it with the lemon sugar before making it any other way!) Later in the day, we simmered a pot of of Sunday sauce on the stove and baked a pumpkin bundt cake for dessert. In between my kitchen adventures, I sat down on my perch and knit row after row of my Topiary wrap while watching scary movies on Netflix. All in all, it was a nice way to end an exhausting week. How about you--what did you do this weekend? It's hard to believe September is already here, isn't it? Every year, the months just seem to fly by, one quicker than the next. For me, the month of September officially marks the transition to the 'cozy' months--I'm content knowing that wool blankets, apple cider, and changing leaves are all just a few short weeks away. September also marks the beginning of our busy season at work, which we refer to as 'Peak.' It's during this time that I have to really have to consciously work to maintain a work/life/craft balance. The next twelve weeks are bound to be long and chaotically productive, so I'm really looking forward to this final, leisurely summer weekend. What are you up to this weekend? We're heading up to Atlantic City, NJ to spend some time relaxing poolside. I plan on casting on for my new cowl pattern on the car ride up and knitting while lounging under an umbrella. No 3 :: Purl Soho's shelves are newly stocked with skeins of Sno by Woolfolk Yarn. This moody, black/green twist reminds me of the beautiful forests we drove past during our trip to Germany last September. Enjoy the last of the summer sun & have a safe holiday weekend! This past Saturday, I had the entire house to myself, which is a very, very rare treat. Besides eating nothing but carbs all day, I spent a considerable amount of time parked on the couch watching cheesy, made-for-TV movies and swatching my Tosh Vintage yarn. When I spotted these midnight-colored speckles on a shelf at Loop, I knew right away they wanted to come home with me. How perfect would they be worked into a cowl to go with my winter coat? This yarn is super hardy--I kept going back and forth on the stitch pattern that flanks the lace panel, and must have ripped out my knitting at least four times. The yarn held up extremely well and showed very little evidence of my woman-handling. Can we all agree that this Optic colorway is pretty amazing? I could stare at those tiny flecks of rust and aqua nestled into the fibers for hours on end. This yarn is just a delight to knit with, and, as Steven West would say, #specklesaresohotrightnow. The yarn is Swan's Island Organic Washable Merino DK in the (perfectly named) Eucalyptus colorway. It's crazy soft and beautifully variegated. I ordered three skeins directly from the Swan's Island website and three different dye-lots arrived in the mail. While normally this would incite panic, I decided to just roll with it. I selected the two that were the most similar in color and alternated skeins every row, carrying the strands along the back of the piece to minimize any pooling or striping in the finished knit. This was a fun little project and I'm glad to finally be able to share it with you! 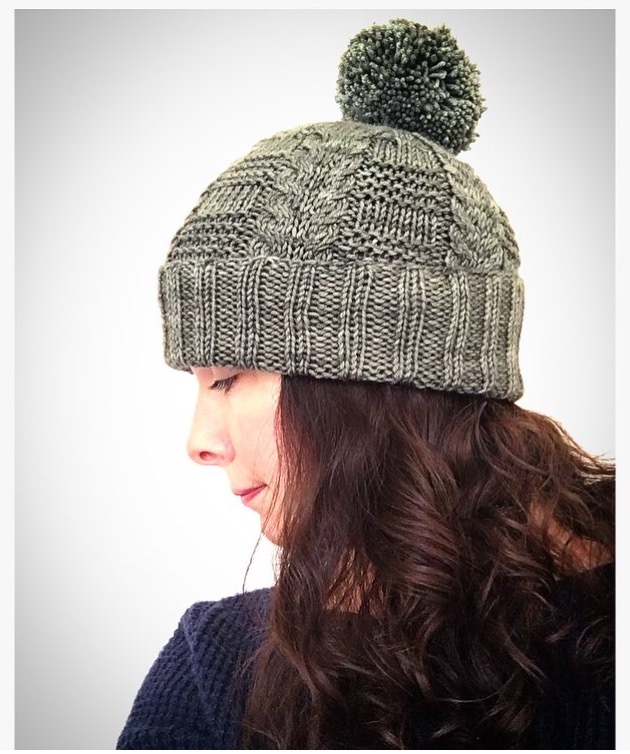 You can grab your copy of the Pondhopper Hat pattern on Ravelry for $4. Be sure to join the Pondhopper knitalong and be on the lookout for the matching fingerless mitts pattern, too! Have a great week! Summer weekends are slowly coming to a close. The boy went back to school yesterday and it's hard to believe that my little guy is now a 10th grader. In just three short years, he'll be off to school and we'll be empty nesters...it's kind of bizarre to think about. He's starting driver's ed this year, which I'm completely unprepared for--I have a hard time picturing him behind the wheel of a car, especially since I still have to remind him to close the cereal box before putting it back into the pantry. Teenagers. What's everyone up to this weekend? I'm so excited because the hubby and I are going to see Barbra Streisand in concert this Saturday! My parents gave me the tickets for my 40th birthday--my Dad and I are huge fans (I know, I have pretty old musical tastes), so the four of us are going to have a fun night on the town in Philadelphia. Other than that, I'll be finishing up my test knit for Alicia Plummer's new hat design (it's super cute!) and getting back to work on my Topiary Wrap. Also, I'd like to finally write up the pattern for a pair of socks I designed a while back and put it in my Ravelry shop. I'll be putting out a call for test knitters soon! Jared Flood's book, Woolens finally came out and it looks spectacular. I want to knit everything, starting with this Fair Hills Scarf. Check out the book preview here. The Fringe and Friends Knitalong kicked off this week, and it's fun to watch everyone's progress on Instagram: #fringeandfriendskal2016. If you're interested in learning about top-down sweater construction, Karen has a ton of great tutorials on her blog, including how to incorporate a stitch pattern. I've started using less-expensive, superwash yarn when knitting these hats for little ones and tweens. Many of the hats have been left on school busses, felted in the laundry, or just plain-old lost in the black holes that are their bedrooms. I'm looking forward to the day when I can transition them to the Shelter yarns of this world! This hat is a gift for my Aunt, who is going through chemo; I wanted something that's not only super-soft against the skin, but is also easy to take care of. The fine merino worked up into the slouchiest of all the classic cuffed hats I've knit, so I might go down a needle size for both the cuff and the body next time. (Again-must. start watching.) The Plymouth Superwash is a round, bouncy yarn with a beautiful luminosity and drape. The entire time it was on my needles, I kept thinking about how perfect it would be for a baby blanket or a shawl. The pattern suggests using a long-tail tubular cast on, which provides a nice, stretchy edge, but the tried-and-true long-tail cast on works just fine. I've done both with equally nice results! While I truly believe all hats are better with pom poms, I left the pom off of this one so that my Aunt can start wearing it now and not worry about feeling too "wintery". I can always send her one to fasten on once the cooler weather hits! Speaking of cooler weather, Christmas will be here before we know it—it's almost time to start requesting color selections for this year's crop of hats! It seems as if I've been gravitating towards knitting in pale, creamy neutrals lately...there's something about this soft, vanilla ice-cream hue that has an amazingly calming effect after the long, frenetic days at work. Depending on my mood, I shift from the undemanding ease of the seed stitch on the Marian Cowl (top picture) to the more intricate cabled lace stitches on the Topiary Wrap (bottom). I reach for the first when my hands need to be occupied, the latter when I want to refocus my brain on non-work things. Whichever project I choose, the minute the needles start to click, I feel completely calm and untroubled—as if all is right in the world. I bet this is true for most knitters. Aside from the meditative powers of repeating rows and rows of stitches, it makes me happy to think about the recipient of each knitted piece. I'm sure one of my teenage nieces will claim the cowl, as they so often do with the knits they find around my house. The shawl is going to be a surprise gift for my mother-in-law. Sadly, she has a wool allergy, so this cotton-blend should feel nice and soft against her skin. Tell me—what types of projects do you drift towards at the end of a long day? I was pretty excited this past week when my new book, Barbara G. Walker's A Treasury of Knitting Patterns arrived on my doorstep. It's been in my Amazon cart for about a year now, I finally decided to check it out! The evening it arrived, I tucked myself into bed and started paging through each of the sections, making notes of the stitch patterns I wanted to try. I love having something simple on the needles, especially when I'm also working on something that requires a little more concentration. It's nice to have something that you can pick up, knit a few stitches or rows, then put it back down without having to remember where you are in the pattern. On Sunday, I decided to try something a little different, the Double Mock Ribbing stitch, this time in navy cotton. While the Roman Rib resulted in a springy fabric, the structure of this stitch pattern resulted in a very flat textile with very little give. I probably wouldn't use this stitch in a garment—it's much better suited for household items such as pillow covers, table runners, or placemats. I cast on 32 stitches for each square, knitting a few rows of garter stitch at the beginning and end of the swatch, as well as the first and last three stitches of each row. This way, these simple cotton swatches can be repurposed as dishcloths for the kitchen! Last weekend, my second attempt at the Barnwood Hat finally came off the needles. The first one that I knit was gigantic because I was too lazy to check gauge, so for this version, I went down to size 5 needles for the ribbing and size 7 for the lace pattern. This one fits much, much better! Lesson learned: always. check. gauge. The pattern calls for the alternate cable cast on, which I've never done before. Now that I know how to do it, I don't think I'll ever do a long tail cast on a ribbed edge with a long tail cast on ever again! Wooly Wormhead has an easy-to-follow tutorial here. As per the instructions, after casting on my stitches, I worked the first row of the hat flat before joining in the round. 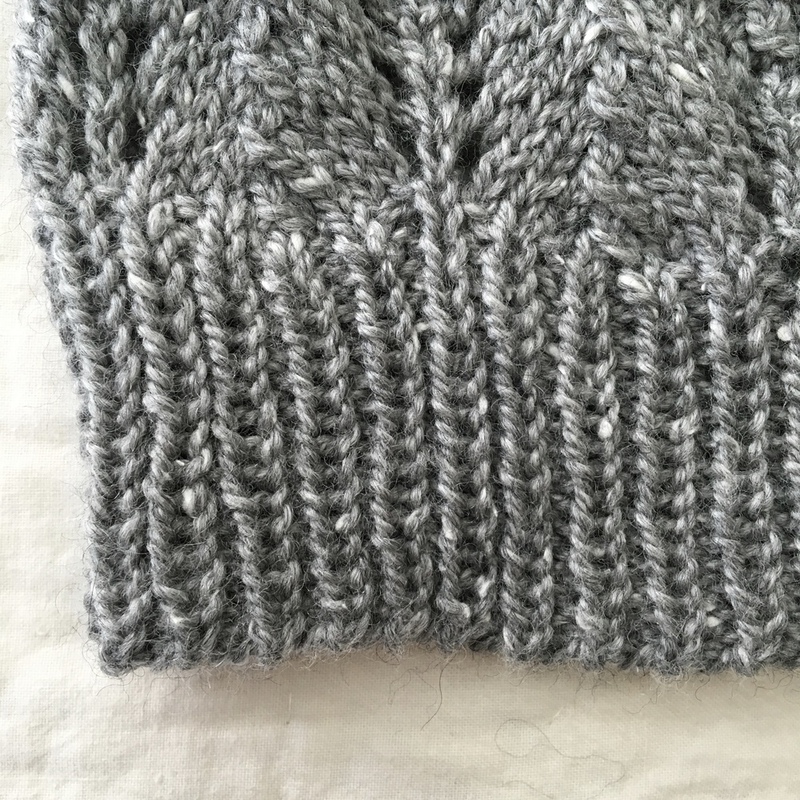 The alternate cable cast on gives the hat a nice, stretchy, neatly-ribbed edge. It appears as if there's no cast on at all—as if the 1x1 rib simply manifested. Clever. 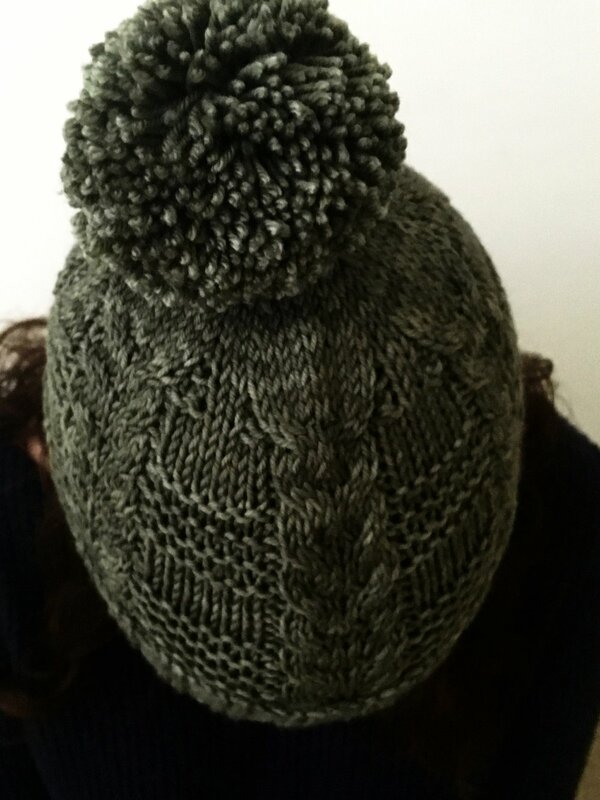 The hat is knit in The Fibre Co.'s Acadia yarn in the Mountain Ash colorway. The fiber's a soft, drapey, DK-weight blend of merino wool, alpaca, and silk. I'm so in love with this yarn. It would be absolutely gorgeous knit into a classic crewneck sweater. The silk noil (the short fiber left over from combing wool or spinning silk) gives the yarn a slight tweed effect, adding to the rustic feel of the hat. It ever-so-slightly camouflages the leaf pattern until the hat is worn. It's still a teeny-bit slouchy, but I think that's because my noggin's a bit small at 21". If I were to knit this for myself, I'd probably cast on for the teen version. I'm excited to pack this one up and send it out to someone very special this week! This chunky beauty is for my niece, age 13. Whenever she visits the house, she heads straight for the couch and my hand-knit Montauk blanket. She's been asking for a blanket of her own for months now, and the minute I saw Purl Soho's Beautyberry Blanket pattern, I knew it was the one for her. I really wanted to use the Gentle Giant that the pattern called for, but at $418 for the throw size, it was just a teeny bit out of my budget. After a little research, I decided on Knit Picks Tuff Puff, a lovely super bulky alternative that worked out to a very reasonable $71. The pattern is pretty spectacular... The front side has a beautiful honeycomb effect, the creamy white stitches framing the silver yarn in tidy, geometric outlines. The stitch pattern combined with the large gauge of the yarn resulted in a warm, lofty knit that's perfect for midday nap sessions. Things got a little tricky when it came to picking up and knitting stitches for the attached i-cord border. I wish I had used a lighter hand when knitting the i-cord, as the edges of the blanket curled in a little bit once the ends were grafted. After a bit of gentle hand blocking, this seemed to resolve itself. Even though I calculated 13 skeins of white and 9 skeins of silver for yardage, I only ended up using 10 and 6 skeins, respectively. When joining new balls, I did a simple wet felt join, which eliminated the need to weave in all of those pesky ends. The yarn does develop a soft halo after extensive handling, but I think that just adds to the charm of the finished knit. Overall, this is a showstopper of a piece and I couldn’t be more thrilled! Full project details on Ravelry. The weekend was long, humid, and hot—which was perfect because it gave me an excuse to retreat into the cool, air-conditioned comfort of our little house. I was a busy-bee this weekend—furiously knitting my second attempt of the Barnwood Hat, which happily came off the needles and was promptly blocked. My in-laws came for a visit on Saturday, bearing jars of homemade blackberry and black raspberry jelly, along with two enormous zucchini from the local Amish market. I knew right away that I wanted to turn at least one of the gigantic beauties into a pan of zucchini bread, so Sunday afternoon was spent grating, squeezing, mixing and baking. If you’re looking for a good zucchini bread recipe, try Smitten Kitchen’s—I might add a splash more vanilla next time, but it’s so simple and delicious. Be sure to try it warm from the oven with a small smear of butter…just trust me on this. While the bread was baking, we made a simple caprese salad with the most beautiful roma tomatoes and soft bocconcini. All you need to do is toss them into a bowl with good, extra virgin olive oil, a splash of balsamic vinegar, fresh basil, sea salt and black pepper and you have the perfect summer lunch. Vegetables are so good this time of year, aren't they? We didn’t get to plant our garden this spring, but what’s nice about our community is that it backs up to a small farm; the farmers were kind enough to set up a little produce stand right in the neighborhood. On Sunday, we stopped and bought fresh corn on the cob and a little jar of flowers for the kitchen table. We feel really lucky to have locally-grown ingredients available right in our backyard. I was able to get my hands a little dirty this weekend, repotting the Bird’s Nest fern we bought from Terrain two years ago. It had long outgrown its container, so we moved it into a bigger home—a pretty, red ceramic pot. She's perched in my knitting room on top of my yarn chest—her green, ruffled leaves catch the light in the most beautiful way. Tell me—how to do spend your summer days? Also, what’s on your needles? While the coffee was brewing this past weekend, I rummaged through the yarn stash looking for a little inspiration. I was thrilled when I stumbled across these two beauties tucked away inside a Quince & Co. bag behind my knitting chair! This beautiful Léttlopi Icelandic Wool was bought from Tolt Yarn and Wool many months ago (along with my Farm to Needle Tote Bag) and I completely forgot I had them! This workhorse, aran-weight yarn is traditionally used for Lopapeysa, Icelandic color work sweaters, but I'm planning to knit them into some warm, fingerless mitts to get me through the winter. Pattern suggestions are greatly appreciated! If you haven't yet visited the Tolt website, I hope you take a few minutes to explore all the wooly-goodness it has to offer. Anna Dianich has created a gorgeous little world for fiber-lovers, including events like Camp Tolt, knitting classes, and a beautifully curated shop. When I ordered my tote and wool, the packaged arrived with lovely brand gestures including a hand-written thank you note and two yarn samples—such a sweet little way to bundle an order! Tell me—what are your favorite online knitting shops? This weekend was everything I hoped it would be—a weekend spent in my knitting room with row after row of lace knitting, hot coffee, and binge-watching TV. I finished Orange is the New Black and started The Americans. How awesome is Keri Russel's 80's-style wardrobe? On Saturday, there were Martinis with blue-cheese stuffed olives, and on Sunday, we enjoyed some Dark & Stormy cocktails while catching up on the DVR. My two hats had a nice soak in some lavender-scented lanolin wash before they were blocked, and I'm sad to say that I'm going to need to completely frog the Barnwood Hat—it's gigantic! I think I'll move down to a size US 5 circular needle in order to make the pattern work with the Fibre Co. Acadia yarn. Unfortunately, this means the recipient is still weeks away from receiving her gift! How about you? Did you enjoy a nice, lazy weekend full of knitting? Last night, the Barnwood Hat came off the needles, and as expected, it definitely has that hipster slouch. The pattern recommends that you block the lace over a balloon, so I'll have to inflate it just enough to set the pattern but not make the hat any larger. I'm debating putting it in the dryer on low heat for a very short amount of time to slightly shrink it, however, I'm afraid of felting those beautiful leaves. If any knitters would like to impart some advice, I'm listening! Swatching. 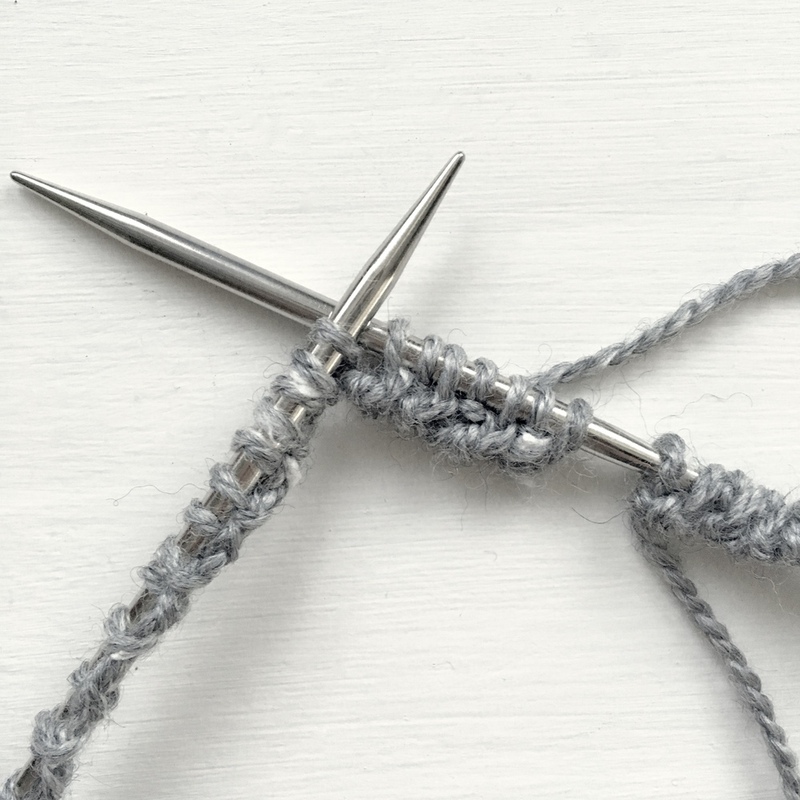 Some knitters love to take the time at the beginning of a project to test and make sure that the combination of yarn, needles and knitting tension all add up to the perfect gauge. After all, good gauge means a well-fitting garment. Other knitters, like myself, tend to dive head-first into new projects, eager to get that new skein of wool onto the needles—gauge be damned. As long as we're using the right size needles and correct yarn weight, we should be cool, right? Not so much. I'm currently knitting the adult size of Alicia Plummer's beautiful Barnwood Hat, in The Fibre Co.'s luminous Acadia yarn. First, let me just say how much I love this pattern and the yarn—the lace motif is easy-peasy to remember (especially while you're catching up on OITNB) and the yarn has such a soft, light hand thanks to the addition of alpaca and silk. The pattern says the hat should fit a head circumference of 22" once blocked. I'm afraid that while I have the yarn weight and the needle sizes correct, my tension may be a little loose for this project. I'm almost to the crown and the body circumference seems a little bit wider than it should—it's already measuring 9" across. Knowing how much lace grows once it's blocked, I'm pretty sure this is going to be one of those cool, slouchy hats vs. a knitted cap. I think next time I'll swatch. What about you, knitters--how many of you really swatch?